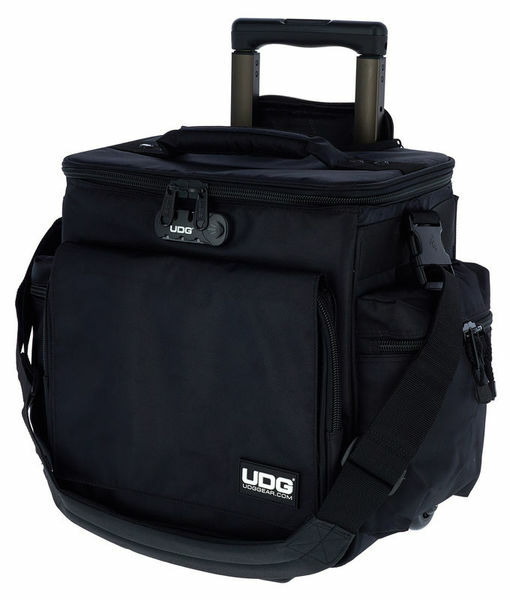 With its reinforced three-stage handle, robust impact protection and improved wheel housing, the SlingBag Trolley DELUXE is not only a sturdy means of transport for records but a reliable companion too. Great overall bag, especially the wide side pockets, included CD covers and plastic protection under the main flap (against rain). The castors are of quality and the whole bag gives a good impression. One negative point: the screws holding the plastic handle on the telescopic aluminum supports tend to unscrew themselves with time and vibration, giving rise to a handle that moves slightly. The plastic flap, although essential to protect the maxi, can be cumbersome when you want to browse its collection in the club. We will opt for a clothes peg heavy enough to fix on the transparent plastic flap to make it fall towards the back of the bag so that it does not fall back on the vinyls. Super material-great processing !!! The bag is really sturdy !! Even if you are often traveling with the plane, the bag holds all your promises !! ID: 110303 © 1996–2019 Thomann GmbH Thomann loves you, because you rock!